Delayed (again) - Getting where? 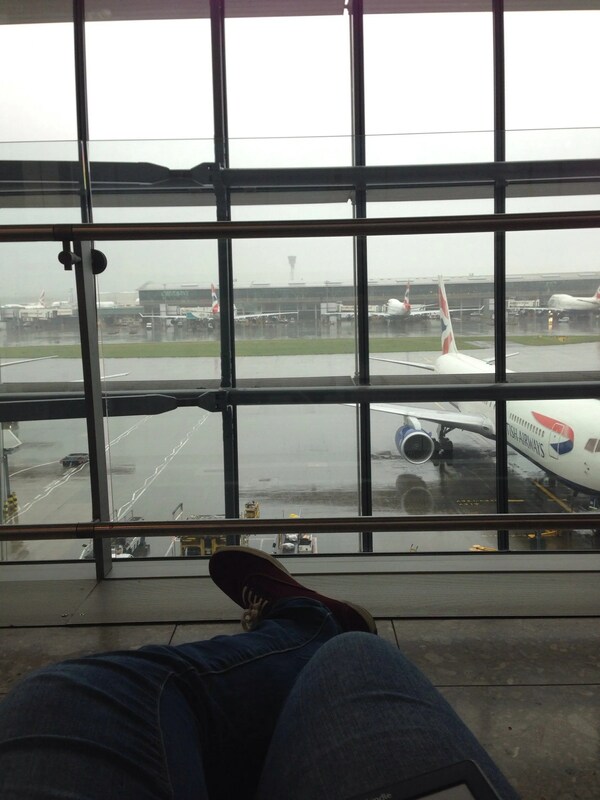 I am becoming a zen master at spending many hours in airports. And I even have a cold! My flight out of Edinburgh boarded on time but sat on the ground for 45 extra minutes because of the weather in London. Landing slots all pushed back because of high winds. It ended up squeezing my already short connection time to an impossible-in-a-massive-airport 30 minutes once I was off the plane. It wasn’t gonna happen. In fact they had already re-booked me onto a later flight before we even landed. Running through Heathrow T5. A plus! It was definitely nice to be notified of the futility of such an action before I attempted it. However. This is all ok. I mean, it’s kind of annoying, but also, what am I gonna do about it? Due to said cold (it’s kind of a bad one) I’m slightly more miserable about sitting around in public for 7 hours than I normally would be, but I’m doing pretty well considering the circumstances. I loaded up on cold meds and bought myself a smoothie full of ginger and stuff from Giraffe the minute I got through flight connections. No airport beers for me today. 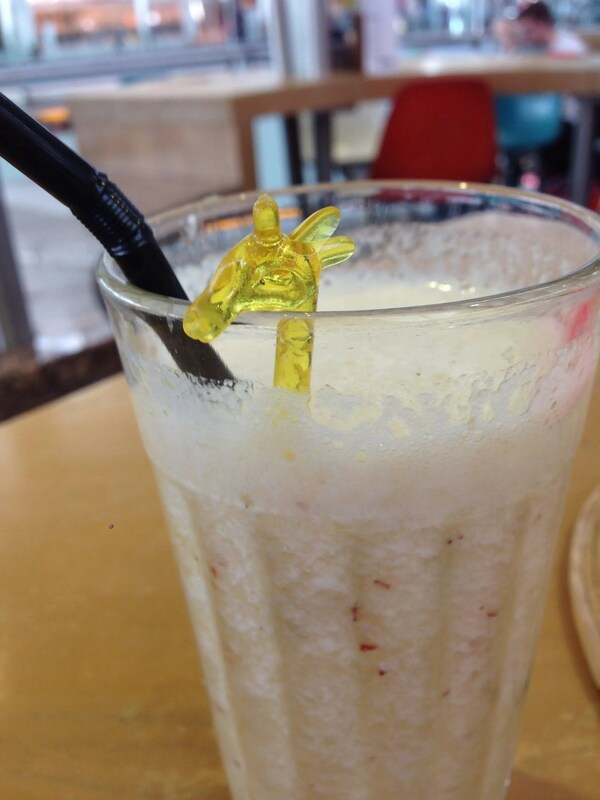 There’s a giraffe in my smoothie. Then I managed to find the Quiet Area of T5 A gates, which is tucked away behind the massive Duty Free shop between gates 12 and 13. There are lounge chairs here. And they aren’t luxury sofas or anything, but they’re… loungey. It’s easy to forget how bloody crowded the place is sitting here because it IS actually pretty quiet, save for the announcements. Not too many people walking by. Charging sockets at every seat. A nice view of the planes (and the rubbish weather). I spent two hours stretched out lazily reading (Station Eleven , which I’m loving) and watching silly airport vehicles in the rain. It was nice! And hey, I’m not at work! Then I went and used my £10 voucher from the delay on some head-clearing noodles at Wagamama. Any day on which I get to eat noodles can’t be all bad. Particularly when someone else is picking up the bill. There was a lot of chilli and ginger and lemongrass involved, so I feel like I’m working on healing myself. Although now I’m a little soup-bloated. But no matter! I’m back in the loungey chairs to write this while I wait my final hour or so. I must apologise to whoever ends up next to me on this flight. I am the girl you do NOT want to be sitting near. I am the one who is doling out the post-flight colds. I have often been on the receiving end. I’m trying to keep it to myself as much as possible but I’m sure everyone pretty much hates me. WHO GETS A CHEST COLD TWO DAYS BEFORE A FLIGHT. Well done, body! Also it’s kind of weird reading a book about life after a flu that wipes out most of civilisation when you’re going around plaguing fellow air travelers. I’m sorry, world. I am. Truly. Hopefully I’m not patient zero of the apocalypse. Anyway. I got my parents to re-book the restaurant for lunch the day I fly home, so I’ll still see them AND eat the food (and my Dad will have more time to practice his ‘Bruichladdich’s and ‘Caol Ila’s). And I’ll be on an A380 on the way home, so I’ll still deliver on my promises to coworkers – who were even more excited than me when I said ‘top deck!’ – of pictures of the experience. I do wish this cold medicine was a bit stronger though. And I’m looking forward to a G&T, a film, and a snooze once I’m in the air.